It’s day two of a juice fast that I foolishly suggested to my husband a few weeks ago. We’d meant to do and be done with it before our holiday before the May Long weekend, but time, space and another plague kept us from it. So I find myself juicing and hungry today. For me, it’s day three of limited intake. 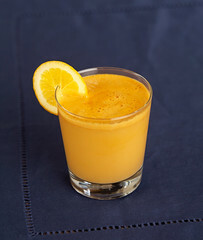 The “rules” of the fast stipulate that a person should slowly eliminate foods from the diet and gradually decrease intake for about a week-ish prior to juicing. I held back on Monday and journeyed into yesterday with a half-empty tummy. He regarded me quietly. His tummy rumbling in protest against a breakfast of orange juice and herbal tea. It wasn’t. I’d made veggie chilli for Dee. “Why does she get to eat?” he asked. “Dad! I’m too little to juice fast,” she chimed in quickly because the child’s self-interest is never far from the surface. “A likely excuse,” he grumbled as she souped and he slurped back another glass of green goo. “You decided,” I reminded him. “Yes,” and I dug back in my memory for the tape of the conversation that basically had me pointing out that we should fast a couple of days and him over-ruling me in favor of the end of the week. “I don’t recall it that way,” he said. “Can you say that with certitude?” I asked. When I spoke to him today right around lunch, he sounded like Frodo as he was slipping into the land of the Ring Wraiths. And I am involuntarily so. Good luck! I’ve been intermittent fasting for a little while now — a month or two — and it’s had impact. I’ve not had the courage to juice fast though, or water fast. I get a headache if I go a full 24-hours without food and I know that means I’m very toxic, but I’m too chicken to tough it out. You don’t have to do a full day. Often I juice from morning to supper and eat a very light supper. I’ve been thinking I might adopt a fast til evening approach a few days of the month, myself. It leaves a person with a feeling of being “unburdened” if that makes sense. Having practiced yoga for three years now, I find that my food choices have changed a lot and that often I skip things that I would have eaten or drank in the past simply b/c the idea of them makes me feel bloated.